At Percussion, we serve to the beat of food, family and fun. Percussion opened in May 2017 and is located on the west end of Osceola off Interstate 35. We opened the restaurant with the thought of cultivating a family friendly atmosphere that is both relevant and receptive. At Percussion, you'll experience something extraordinary when you step through the doors because we believe food is more than simply a necessity of life, but rather a way to draw everyone together. This instinct has been ingrained in all of us since the beginning of time and we aim to share that experience with you. Battered and fried white Cheddar cheese. Tortilla chips topped with chicken and our homemade queso. Baked homemade skins with a 3 cheese blend and bacon. Hand cut, battered and fried. Homemade mashed potatoes mixed with bacon, cheese, butter and sour cream. Hand shaped, battered and fried. Choose plain or Buffalo served with fries. Italian, Ranch, Bleu Cheese, Raspberry Vinaigrette and French Dressing. Iceberg / Romaine lettuce mix with cucumbers, tomatoes and carrots topped with hand cut and breaded chicken strips ( plain or buffalo style ) your choice of dressing or grilled Chicken Spiedie with Italian dressing. Our grilled ground beef patty served with cottage cheese and seasonal side. Baby spinach, Mandarin oranges and strawberries lightly tossed with a creamy poppy seed dressing. Seasonal offerings with cottage cheese, egg salad & tuna salad finger sandwiches. Your choice of plain or bbq. Hand breaded, deep fried pork loin served on a bun. Herb topped chicken breast baked and sliced, served on a hoagie roll. Spicy grinder sausage blend on a hoagie roll with mozzarella, banana peppers, and Jalapeño peppers. (Originated in Binghamton, NY) - Special Italian marinated chicken breast grilled and served on a bun. Grilled ribeye topped with green peppers, mushrooms and onions served on a hoagie roll. Deep fried beer battered cod served on a bun. Hand cut and breaded chicken breast strips deep fried and finished with Frank's Hot Sauce. Homemade meatballs marinara and mozzerella cheese served on a hoagie roll. A quarter pound all beef hot dog stuffed with cheese and wrapped with bacon then deep fried. Plain - Stuffed with American cheese and wrapped with Hickory smoked bacon. Spicy - Stuffed with PepperJack cheese and wrapped with jalapeño bacon. Gemelli pasta with our own creamy Alfredo Sauce tossed with fresh baked, Italian herbed chicken breast cubes. Gemelli Pasta with out own Marinara Sauce with your choice of Graziano's Sausage or fresh baked, Italian herbed chicken cubes. Our creamy homemade cheese sauce with Gemelli Pasta pumped up with Frank’s Hot Sauce and a Habanero Sauce. (Our own blend of beef) - Served with lettuce, tomato, onion, pickle and chips. Choice of American, Cheddar, Provolone or PepperJack cheese. Our custom beef blend stuffed with greatness. Italian - Pepperoni, ham, sausage and provolone. Topped with provolone and bacon. Spicy - PepperJack cheese and Jalapeños. Topped with PepperJack cheese and Jalapeño bacon. Prefer a custom approach? Build your own stuffed burger. Choose from: Pepperoni, Ham, Sausage, Jalepenos, Provolone, PepperJack, Cheddar and American cheese. Tortilla chips topped with salsa chicken and our homemade queso. (Our own blend of beef) - Served with lettuce, tomato, onion, pickle and fries. Choice of American, Cheddar, Provolone or PepperJack cheese. Spicy grinder sausage blend on a hoagie roll with mozzarella, banana peppers and Jalapeño peppers. (Originated in Binghamton, NY) – Special Italian marinated chicken breast grilled and served on a bun. Homemade meatballs with Marinara and Mozzarella cheese served on a hoagie roll. 1/4 Pound all beef hot dog stuffed with cheese and wrapped with bacon then deep fried. 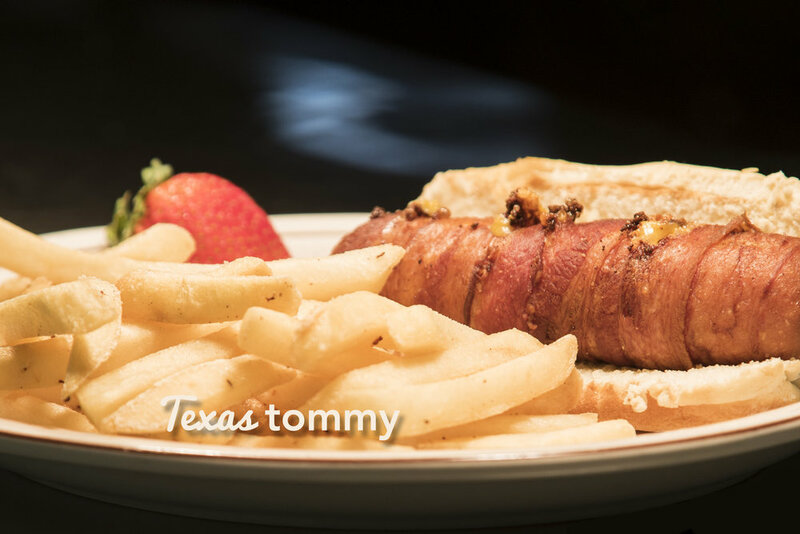 Regular - Stuffed with American cheese and wrapped with Hickory smoked bacon. Spicy - Stuffed with Pepperjack cheese and wrapped with Jalapeño bacon and served with Jalapeño peppers. All entrees include salad bar. Grilled and served with wild rice. Sautéed with garlic and lemon, served over pasta. Well spiced and simmered chicken in a stock pot for that great rich flavor. Paired with egg noodles and served over mashed potatoes. Topped with a sundried tomato cream sauce with vegetable and choice of side dish. Hand breaded chicken breast with Marinara Sauce and Mozzarella cheese. Served with pasta. Round roast beef slow cooked with carrots, celery, onions and potatoes. Gemelli Pasta with our own Marinara Sauce with your choice of Graziano’s Sausage or fresh baked, Italian herbed chicken breast cubes. A homemade favorite-layers of lasagna noodles with spiced ground beef, Italian sausage, Ricotta Cheese, Parmesan Cheese, Mozzarella Cheese and Marinara Sauce. Baked pork loin well seasoned with garlic and spices and topped with apple ginger chutney served with vegetable and choice of side dish. Meal includes a drink. Available Sides: Fruit Cup, Cottage Cheese, and French Fries. The Scooby Solo™, our famous Calzone starts with our Amazing Garlic Butter TastyCrust™ then filled with Mozzarella, Cheddar and Provolone Cheeses, 4 Toppings of your choice then baked to golden perfection. It’s the World’s Ultimate Munchie™! Served with Ranch or Marinara sauce for dipping. What do you crave? Fill this Scooby with your choice of up to 4 Toppings, comes with Mozzarella, Provolone and Cheddar Cheeses. Served with side of Ranch or Marinara sauce. Ultimate Cheese Combination! Loaded Mozzarella, Cheddar and Provolone Cheeses. Ranch or Marinara are served on the side. Loaded with Black Olives, Chopped Onions, Mushrooms, Green Peppers and Tomatoes. Served with Ranch or Marinara. This Scooby has Spicy Sausage (Grinder) meat loaded with Onions, Green Peppers, Jalapeños and Banana Peppers creating the perfect balance of heat and avor! Brushed with Amazing Garlic Butter and served with Marinara sauce. Our Supreme Scooby Solo is stuffed with Grazianos Italian Sausage, Pepperoni, Mushrooms and Freshly Chopped Onions and Green Peppers. Covered in our own Amazing Garlic Butter & served with Ranch or Marinara. Ground beef, bacon, pickles, and fresh onions with mozzarella, provolone, and cheddar. Covered in Amazing Garlic Butter and served with ranch or marinara sauce. Our TastyCrust™ is available with 3 different flavor toppings including handtossed, garlic butter, and parmesan. Our Supreme pizza is made with Grazianos® Italian Sausage, Pepperoni, Mushrooms, Chopped Onions & Green Peppers. Our exclusive Grinder Meat, Onions, Green Peppers, Banana Peppers and Jalapeños = Spicy & Full of Flavor! Veggie Lovers look right here! Chopped Onions, Mushrooms, Black Olives, Tomatoes, Green Peppers with Mozzarella, Provolone and Cheddar Cheese. Alfredo Sauce, Garlic, Bacon, Fresh Tomatoes, Beef, Mozzarella, Provolone & Cheddar Cheeses. Amazing! Alfredo Sauce, Chicken, Mushrooms, Onions, Green Peppers, Tomatoes, Mozzarella, Provolone & Cheddar Cheeses. Build your own custom pizza, just the way you like it! Start with your favorite topping and build from there! Vanilla, Chocolate, Strawberry, Oreo, or Chocolate Brownie, Strawberry Shortcake. Layers of ice cream sandwiches and Oreo cookie ice cream. Chocolate fudge brownie, a scoop of vanilla ice cream, topped with whipped cream and chocolate syrup drizzle. Homemade biscuit style shortcake covered with sweet strawberries and whipped cream. NLP Signature Homemade Dough baked golden brown and topped with cinnamon & sugar. Served with frosting packets. Business "lunch-ins", private parties, and catering. Call (641) 223-8098 during business hours for more information or to make a reservation.